The Romance Cover: Experiment in Terror ~ 12 days of Dexmas ~ Dead Sky Morning (EiT 3) by Karina Halle with Giveaway! 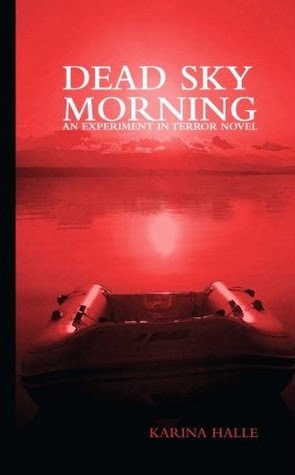 Experiment in Terror ~ 12 days of Dexmas ~ Dead Sky Morning (EiT 3) by Karina Halle with Giveaway! If you've been following the blog for a while you'll know that Willow is a huge Karina Halle fan and in particular of her Experiment in Terror Series. She is always trying to introduce new readers to Dex and Perry. If you haven't read the series, now is a perfect time to start as the 12 Days of Dexmas is a promotional Event where you can pick up the books for .99 cents! What are you waiting for? So what are the Experiment in Terror books about? They are Mature NA/Adult Romantic Suspense/Horror books that centre around two characters, Dex Foray and Perry Palomino. They form an internet Ghost Hunting show, Experiment in Terror. In each book they are off on an different adventure filming for the show from ghosts to skinwalkers to Sasquatches to voodoo magic. And of course whilst all this is going on there is the story of the complicated and brilliant relationship between the two. Today we are celebrating book 3 ~ Dead Sky Morning. This book is Willow's favourite of the series (along with book 7 - Come Alive). It seriously creeped her out and remains the scariest book of the series for her. Add in the developments in Dex and Perry's relationship and its easy to see why this was the book that got her hooked on the series. He took my face in his comforting hands and gazed at me, closer, deeper. My heart started to jump around sporadically, my nerves were on fire. I loved and hated it at the same time. I hated what he was doing to me, but I loved him. I hated my feelings, but…I loved him. I hate that he could just look at me like that and I couldn’t think of anything else. “I’m still me,” I said heavily. “Can you blame me?” I whispered, too aware of how close our mouths were. Your chance to win an EiT Swag pack!